Symfony Flex can be considered a Composer wrapper, in that it provides your Symfony project with additional options during installation and configuration. It was developed with simplicity in mind, and obviously heavily influenced by the user-friendliness of Laravel. Remember, Laravel got to its current level of popularity due to its ease of use and the low entry barrier it provides newcomers with, and Symfony wanted to emulate this. It should be noted that both Flex and Symfony 4 are still under development, slated for release somewhere at the end of November this year (2017). As such, some of the features mentioned in this post may have changed by the time you read it, but we’ll do our best to keep it up to date. 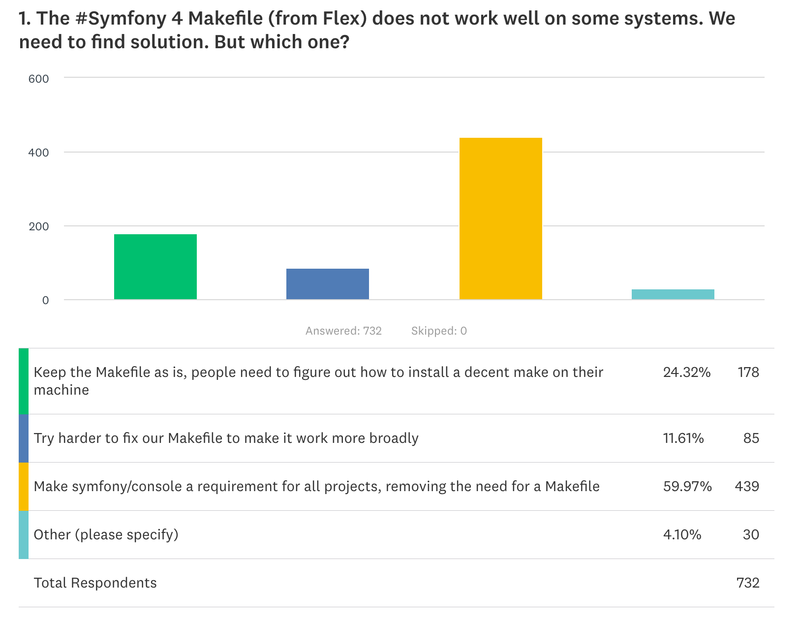 Most notably, the use of a makefile and the make tool to build a project if Symfony/Console is unavailable is still up in the air, as it seems to not be working properly on some operating systems. Fabien recently held a survey around this, asking for the community’s suggestions to a replacement, and overwhelmingly, the community voted in favor of just making Symfony/Console required. all folders are optional. If your project isn’t using one, it doesn’t have to be there. This makes the directory tree much simpler and more readable. Additionally, often useless files like .htaccess, LICENSE, and README have been removed as well – a project which needs those can easily add them. there is no more web folder. Instead, there is the public folder, like in all other major frameworks. This consolidates user experience across ecosystems. source code goes under /src. No /app. Flex will have its own Symfony-verified list of packages that are referenced by one and one alias alone. So executing composer require cli will actually trigger Flex, which will look in its list of packages, find the one tagged as cli (in this case, Symfony Console), and install it. These “official” packages are called recipes, and can be found here. To accept user-submitted recipes, a flag exists in Flex’s configuration which needs to be set to true: composer config extra.symfony.allow-contrib true. Those recipes can be found here. By officially endorsing some packages, Symfony is in many ways becoming as opinionated as Laravel. While this is bad in some ways, it’s very good in many more ways: a consolidated, opinionated way to build Symfony apps used by most people so that everyone is on the same page. bundle fragments no longer need to be custom-activated and added into a ton of files. Flex automates this, as well as their removal. As usual, we’ll assume you’re already running a healthy VM environment like Homestead Improved so you can follow along. 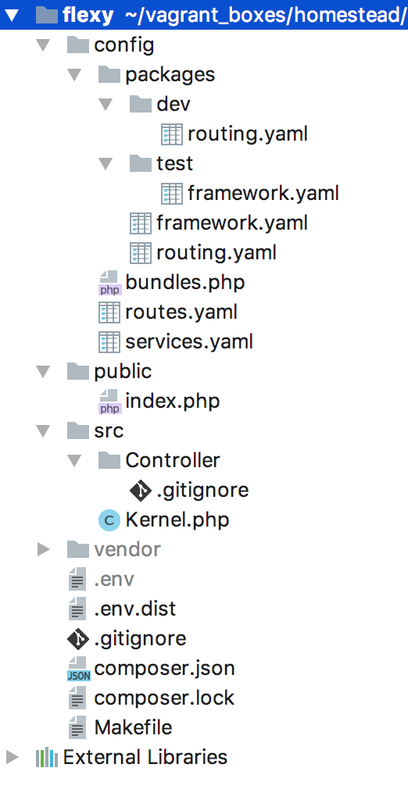 Notice the created directory structure. In /public, we no longer have app.php and app_dev.php, only the index.php file. The type of the environment (test / dev / prod) is now dictated with environment variables, and reads the configuration from the /config folder. Notice how the end of the installation process mentions that make cache-warmup was called, and that you can run make serve. This is where the new Symfony uses the “controversial” Makefile approach mentioned above. This might change. 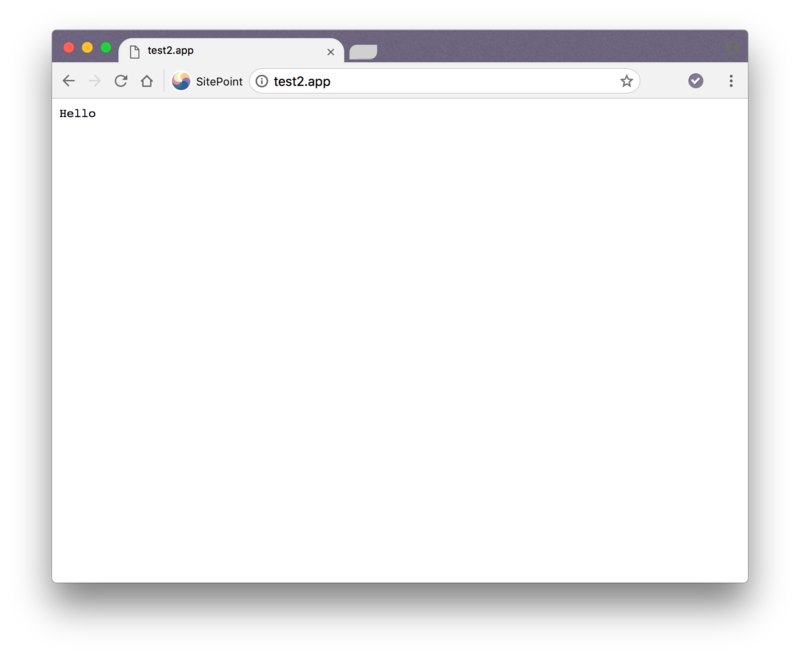 Out of the box, opening this skeleton in the browser will throw an error because no routes have been defined yet. Let’s fix this. adding the “execute” permission to the file on the host machine (not from within the virtual machine), by executing: chmod +x bin/console. This will allow the direct execution of bin/console from within the VM then.